Lao Ma, a Xena mentor. Some have made the claim that the mythology of the Star Wars films is so derivative that it is meaningless. However, it is the very universality of the subject matter that gives it power and makes it so ripe for comparisons with other science fiction/fantasy stories. At first glance, there seems to be little in common between Star Wars and Xena: Warrior Princess (XWP). Yet, two critical characters in the development of the main heroes share many similarities in the roles they play and the means they use to fulfill them. It is a common theme in myth that a young hero is unable to begin his journey without some form of supernatural or spiritual aid or guidance. Often this assistance is embodied in the form of a guide, a surrogate mother or father figure whom the hero comes to rely upon for wisdom and direction. The best known of these is probably Merlin, who ushers Arthur into adulthood and vanishes when the boy has become a man. Once a hero has truly come into his own, the guide is no longer needed, and either dies, vanishes, or leaves the hero's life in some way. Both the central hero of the original Star Wars trilogy, Luke Skywalker, and the hero of XWP, Xena, encounter their guides fairly early in their journeys, and both are irrevocably changed by the lessons imparted upon them. However, both of these guides are not merely well wishing parental stand-ins; each has an agenda in grooming the hero along a certain path that is self-serving and manipulative. While it is unlikely that Lao Ma was modeled on Obi-Wan Kenobi in any way, the semblance is striking and so great, that it is uncanny. Xena first encounters Lao Ma in an adversarial situation, striving to ensure that the emissary of the great Lao does not exert too much of a civilizing influence on her lover Borias. However, after Xena's disastrous kidnapping of Ming T'ien, she is handed over to his father Ming Tzu for whatever punishment he sees fit. Humbled and broken, Xena is hunted like an animal. At this, her lowest point, Lao Ma reveals herself as a would-be protector, saving Xena's life on a physical level. She absconds with Xena to her palace and hides her from the prying eyes of Ming Tzu. Xena reluctantly accepts Lao Ma's help, unsure at first of why it is offered. Luke Sywalker and Ben Kenobi. Luke Skywalker meets his mentor under slightly less dire circumstances. Like Xena, he had known of his guide before actually meeting him. Luke's Uncle Owen dismisses Kenobi as "a crazy old man" unworthy of attention or consideration. Thus, Kenobi is initially announced to the audience as a marginal figure, echoing Lao Ma's words upon her arrival into Borias' camp, where she describes herself as an "insignificant wife". When Luke does meet the old man, it is after a savage attack by the Sandpeople, who no doubt intend to kill Luke after they have ransacked his vehicle. Kenobi happens upon them, saves Luke's life, and takes the young man back to his secluded home. Both Obi-Wan and Lao Ma conceal their true natures when they initially come face to face with their young charges. Kenobi does not even reveal his real name until Luke presses him on the point: "Of course I know him. He's me". In both cases, the guide's primary concern is removing the hero from immediate peril, be it Ming Tzu's dogs or the Sandpeople, and transporting the hero to a safe haven where the deeper nature of the mentor can be revealed. One of the first things Lao Ma does for Xena, after cleaning her up, is to introduce her to a world that she never knew existed. A world governed not by force of will, but rather by rising above that will. "In order to transcend the limitations of that world, you need to stop willing, stop desiring, stop hating," Lao Ma instructs Xena. Xena initially rebuffs her lessons ("I happen to like a good kill"), but Lao Ma's demonstration with the bottle convinces Xena that perhaps there is something greater than killing, bloodshed, and her own ruthless desires. At this point, the lesson itself is less important than impressing upon Xena the existence of a higher realm, and establishing Lao Ma's authenticity as a spiritual guide through lessons of wisdom and the possession of mysterious powers. Likewise, Kenobi shows Luke a greater world than he has ever dreamed. Where Xena was blinded by her own anger, Luke was blinded by his uncle, who, as it is later disclosed, sees things very differently from Kenobi. The old man first gives Luke an almost magic weapon, a lightsaber. From there, the sword is used as a springboard to describe a mystical power known as the Force. In a very similar approach, Lao Ma shows Xena the hair brooch, telling her it could be a weapon, which she then demonstrates the effectiveness of before delving further into her teachings. Kenobi impresses upon Luke that there is another way of looking at the world. In order to embrace that view, like Xena, Luke must shed his current beliefs and be willing to accept something greater than himself that he cannot yet understand. Kenobi's talk of the Force establishes his credentials as a spiritual guide, but it is the Princess Leia's message, referring to him as "General Kenobi" that cements his role as Luke's guide. As Lao Ma ends her introductory lesson with Xena by offering her a new start ("I'm offering you the chance to live"), Kenobi urges Luke on a new path as well ("You must learn the ways of the Force if you're to come with me to Alderaan") before eventually settling on a priceless piece of wisdom: "You must do what you feel is right, of course." The next task that both heroes must complete is their first test in this new world they have been introduced to. For Xena, it is overcoming her will. Lao Ma makes her serve Ming Tzu in an effort to impress upon her that she must learn to act for reasons other than her own desires. Xena manages to do fairly well ("For a few hours, you actually silenced your will. It's a start") and is further initiated into Lao Ma's world. Luke is blinded physically (as Xena's will was bound) and is instructed to "let go your conscious self and act on instinct". In both cases, the message is similar: surrender yourself to a greater power and learn to access it. Luke succeeds just as Xena did when he taps into the Force. Kenobi's encouragement is even similar: "You've just taken your first step into a larger world." Lao Ma keeps her husband incapacitated while she makes the decisions. These early tests also mark the end of the evident altruism of the guides, however. Lao Ma's next lesson is rather darker and much more self-serving. She keeps her husband alive in a coma so that she can rule in his name. While she affects to have a higher purpose in this, telling Xena "It's the only way a woman could rule", essentially she belies her own words about the unimportance of an individual's will. Though Lao Ma attempts to justify her duplicity by telling Xena of an "idiot cousin" who will ascend to the throne should Lao Tzu die and saying that she is not concerned who gets the credit "as long as good is done", she has already decided that she is the best choice to rule. Lao Ma even walks her husband in the garden occasionally "to convince doubters". She frankly admits her scheme to Xena, who, at this point, sees nothing wrong with it. Nevertheless, Lao Ma is committing a major sin of the will, and she undercuts the effectiveness of her teaching. Lao Ma displays her belief that she knows what is best for other people. While her teachings have helped Xena, Lao Ma clearly believes in her own moral superiority, and her actions contradict her words. Obi-Wan makes the same mistake, though the viewer does not realize it until further down the road. Where Lao Ma has concealed the true nature of her husband's condition, Kenobi hides the truth about Luke's father, saying only "he was the best star pilot in the galaxy...a cunning warrior ... and a good friend." Kenobi somehow fails to mention that Luke's father is the villain Darth Vader, who has fallen to the dark side of the Force. 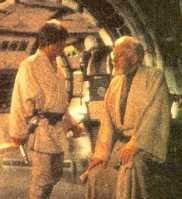 Even as he opens Luke to the potential of the Force, Kenobi keeps him in ignorance about certain things. He too feels he knows what is better for others even at their own expense, just as Lao Ma does. Both of them are willing to use duplicity and manipulation to arrange events the way they think best. Although it is true that Luke and Xena benefit greatly from the lessons their teachers impart, both are being groomed for a greater purpose, and the same one at that: to correct a horrible mistake their mentors made years ago. Lao Ma admits to Xena she does have one weakness, her son, Ming T'ien. His constant rejection of her even as a youth cuts her to the quick, and she finds she loves him despite his coldness toward her. Apparently, he knows of her fondness for him. He boasts to Xena that he knew all along that Lao Ma was his mother and that he was the one who performed her execution because he "knew she wouldn't use her powers to hurt...her little boy". Ming T'ien grows up to become a monster, and Lao Ma's last message to Xena is that the Green Dragon has grown large. Across the world she summons Xena, even as she is about to die, so that the warrior princess can clean up the mess that her former mentor made. Lao Ma had the power to stop her son but could not bring herself to use it. Xena is forced to reach deep inside herself to put aside her anger and her will in order to destroy the menace that Lao Ma could not. Kenobi's story is similar but the consequences are far more tragic. His sin of pride led him to train Luke's father before he was ready to be a teacher. This miscalculation resulted in the creation of the evil warrior Darth Vader. Kenobi meets up with Vader just as Lao Ma does with her son, but like her, he cannot bring himself to kill his adversary. He knows Luke must finish the job he cannot. He even later tells Luke, "You cannot escape your destiny. You must face Darth Vader." Like Lao Ma, he allows himself to be sacrificed because he knows he has a follower who will gain the necessary insight and power to overcome the villain when he could not. Like Xena, Luke must eschew his baser nature and shun his dark side to overcome his adversary. Given the intelligent and cunning natures of both Lao Ma and Obi-Wan Kenobi, it seems highly unlikely that they would fail to take into consideration the possibility that they would need help in bringing down their greatest rivals. Lao Ma says that she sensed greatness in Xena, and Kenobi confides that he is well aware that the Force flows strongly in the Skywalker family. Considering these admissions, it seems likely that Lao Ma and Obi-Wan not only train Xena and Luke for the students' own good, but also specifically manipulate them to solve problems that the guides could not. While two great heroes were forged in the process, neither one of the mentors enlightened their charges for purely noble reasons. In a fitting irony, both guides meet their ends at the hands of the monsters that their sins of pride created. Ed Baker is a double major (English/History) from the University of Virginia. He spends most of his time discussing either Xena or Buffy: The Vampire Slayer on various mailing lists. He is also an avid reader and enjoys creative writing.